If you found this web-page useful consider making a donation to support its upkeep. Thank you. Eventually it had to go, see the Citroen C1 that replaced it. 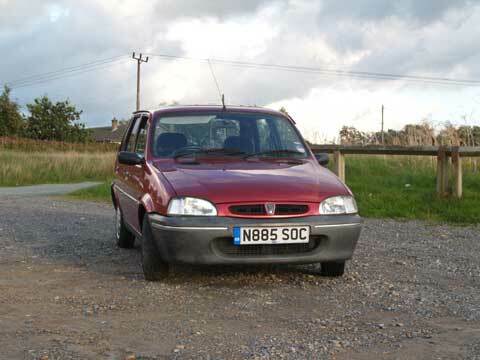 One morning in January 2006 the Rover 100 (Metro) overheated on the way to the hospital. We had owned this Rover since September 2001 without having any serious problems so we were somewhat suprised to find it now going wrong. We had to contact Sam our son to come to the rescue with a bottle of water. I managed to get the car home after topping up the header tank with water. Initially I was worried in case the head gasket needed replacing but there was no frothy oil in the water and didn't appear to be any water in the oil. There was a leak from the temperature switch for the fan in the radiator which meant replacing the sealing washer. When I looked closer at the radiator there was a lot of rust between the vanes at the bottom so I decided to remove it for a closer inspection. There is a metal top hose running along the front of the car which connects to the engine via the rubber top hose so I took this out as well when I found how corroded it was at each end. 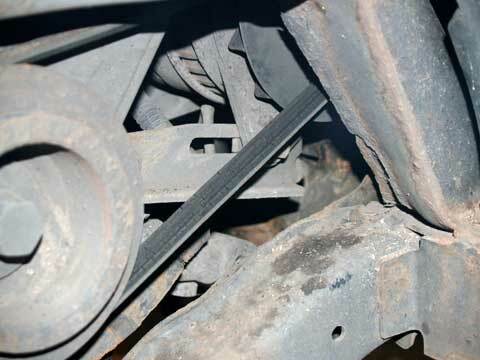 The radiator is located with two brackets at the top each held in place with two bolts, removing these allows the radiator to be leaned back and then lifted clear of the car. All seemed well with the Rover 100 after this, for a while. Then it began to overheat occasionally and the heater would be cold. After asking friends and garage mechanics about K-Series engines and what the possible cause could be I drained the cooling system and tried to ensure there was no airlocks anywhere. This was having to be done regularly now, every couple of weeks it would overheat and have to be topped up and the airlocks chased. Some people were wary of the K-Series engines and thought there was design faults with the cooling system but this Rover with the K-8 engine had been fine for the last 5 years and I assume for the previous 5 years so it could hardly be called a design fault. 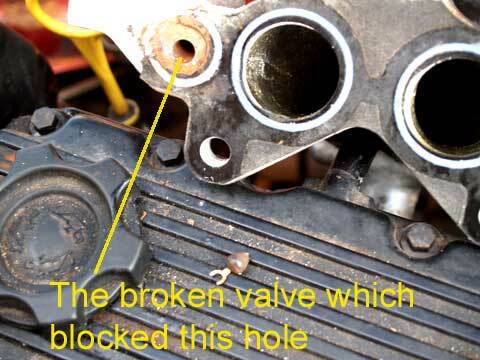 The Freelander engine had been the K-16 and apparently there was a bad batch of head gaskets which caused their problems. I know a number of people who have had no problems with their Freelanders with K-Series engines. There was no bubbling in the header tank, no sign of water in the oil or oil in the water and it still ran very well so I didn't think it was the head gasket that had gone. Eventually I decided to check the thermostat and found this to be working only partly and only in boiling water as compared to a new one which opened much more and at a lower temperature. While doing this job I found one of the pipes going to the inlet manifold had corroded just where it went into the aluminium casting so that had to be replaced too. After all this it still overheated a few weeks later. The bottom hose never seemed to be getting warm while the top hose and the hose going to the heater were getting very hot, the indications were that the water pump was not doing a very good job at all so by August I decided to have a look at that. The water pump is driven by the cam belt so it wasn't a quick job and would have been expensive to have it done at a garage, besides which the garage I normally go to for jobs was fully booked for the next two weeks. So with the help of the Haynes manual I had a go. The front was jacked up and since my axle stands wouldn't fit underneath I used some blocks of timber to rest the sub-frame on and ensured it was safe to carry on. 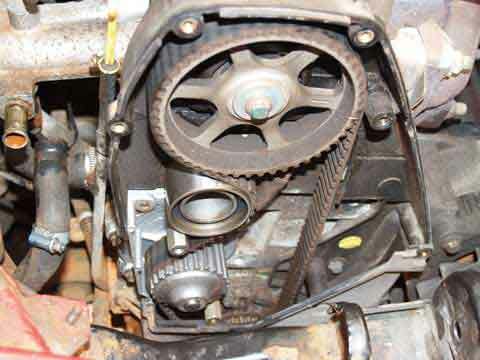 After taking the wheel off the timing belt cover could be taken off. The header tank had to be removed as did the windscreen washer bottle/container to gain easier access to the bolts securing the cover. The fan-belt could be seen now. This was looking the worst for wear with cracks in it so I replaced this too. It shouldn't really be called a fan-belt since it doesn't turn a fan, the radiator fan is electric. So the belt is just for the alternator. 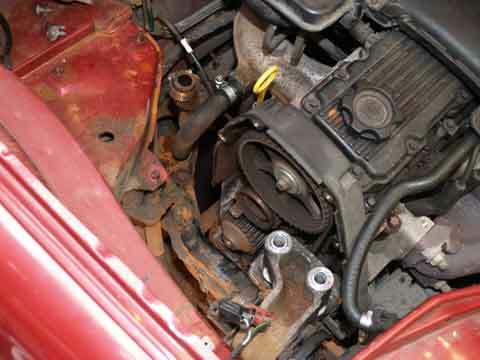 The alternator has to be slackened off to allow the belt to be removed. Plenty of WD-40 and a choice of small spanners and a little socket ratchet were needed to accomplish this. 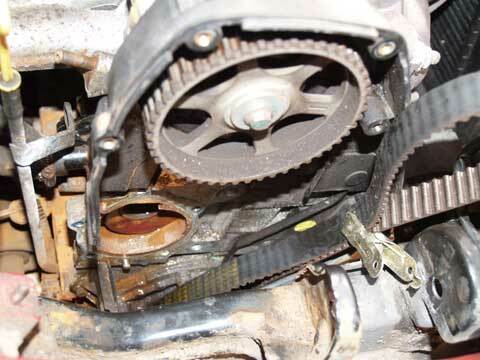 This timing belt cover is in two parts, the upper part comes off after removing several small bolts but the bottom part needs the crankshaft pully removing first. 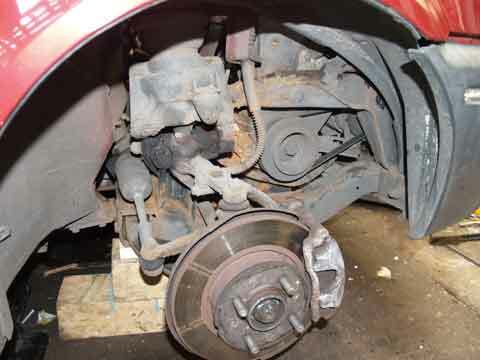 According to the Haynes manual the bolt holding the crankshaft pully in place can be slackened off by having someone press the brake pedal with the car in top gear. This proved not to be the case, or too tight to work for me anyway, so I made do with just having the top cover off. This meant I was going to use the existing cam-belt so that had to be checked for wear. 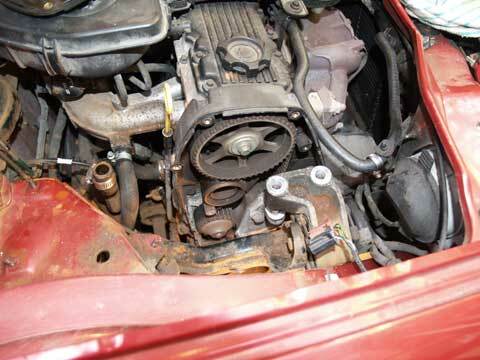 The engine mount is best removed to give better access to the pump. A trolley jack with a piece of wood on it is used to support the engine while the mount is not there, this also helps in removing various bolts by adjusting the height of the engine to get round the sub-frame with a socket to undo the bolts. After removing the cam belt tensioner altogether the belt was moved clear of the water pump and it came off fairly easily. Some of the bolts holding the cover on screw into stand-off posts which in turn screw into the engine block. One of these bolts was rusted and seized in the post so I wanted to replace it. The main dealer didn't have any and said it would be a week or more before he would and the other parts shops said try the main dealer, so I went down the local scrapyard, found a Rover 100 and an older Rover Metro and acquired four of these posts and various other bolts for under �3.00 and it took less than an hour. After cleaning the posts up they looked as good as new and certainly better than the ones I was replacing. When the pump was off I was amazed to find no vanes on it, there should have been six vanes like there are on the new one, so there was no way this could have pumped water round the system, I really thought this would solve the problem. The new pump was fitted together with a new tensioner and a new alternator belt. 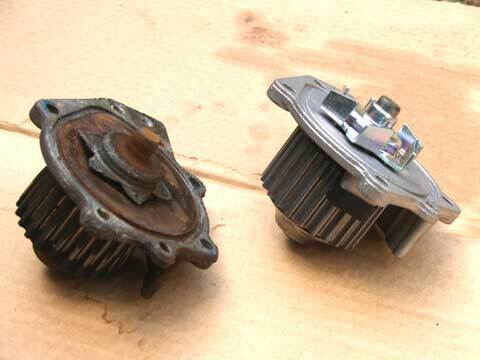 The adjuster for the alternator was very rusty and needed plenty of WD40 and wire-brushing then greasing with copper-grease before it worked properly. Everything else went back together ok and there was no leaks when the water went in. It was almost two weeks before it overheated again. By this time it was getting personnel, I refused to give up. The bottom hose was getting warmer now and the airlocks were easier to bleed but still it would get too hot after about half an hours running, longer than before but still too hot. I looked on the web and searched again for possible causes. On a bulletin board there was a discussion about K-Series engines overheating in normal Metro cars and Rover 200's as opposed to track racing Lotus cars and I found a reference to a valve in the thin pipe from the inlet manifold to the top of the header tank. This pipe allows water from the cylinder head to be pumped back to the tank until the thermostat opens but if the valve sticks or gets blocked then the engine overheats. 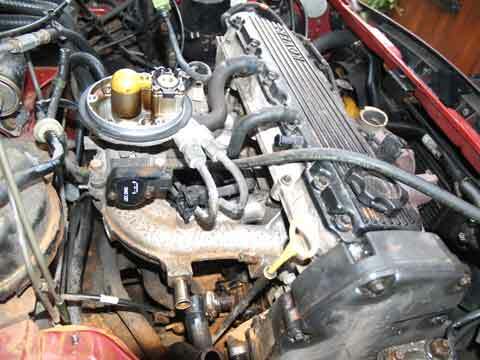 Seemed simple enough, just take off the inlet manifold and remove the sticking ball type valve. So off came the inlet manifold. First the air intake and then according to the manual lots of other pipes and wires to the various sensors but its not really necessary to remove everything, I left the fuel lines connected and the brake vacuum pipe, these were flexible enough to allow me to move the manifold enough to get at the valve hole. Some of the bolts securing the manifold to the cylinder head are difficult to get at and I had to use various sockets to do it and also the bolts to the support rods at the back beneath the manifold. It came off eventually and I was able to ease it up and see the other side of the hole with this valve in and it was blocked. I pushed a rod, a screwdriver to be precise, into the tube and out popped this so called valve. I presume it once had a brass bit on both sides but now there was only one. The hole was cleaned out and everything put back together with a new gasket, eventually. Getting the bolts back in was a little time consumming but with patience and perseverance it got done. I ran the engine for over half an hour and the radiator fan cut in, first time I had seen that happen, the bottom hose was now hot too. The engine temperature gauge went up to almost three quarters, still well below the red, then dropped to halfway and stayed there for another twenty minutes. So then I took it for a run up and down local hills for a further hour and half with no sign of overheating and the heater blowing hot or cold according to where I set the control in the car. I was somewhat relieved. The Rover has been used regularly over the past week including another run into the hillside and seems fine now, just hope it stays that way! 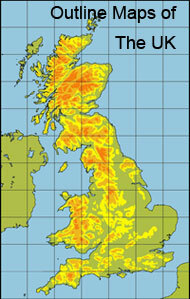 Some weeks later and the Rover 100 is using or losing, a little water on some days, but not on others. Just have to wait and see. 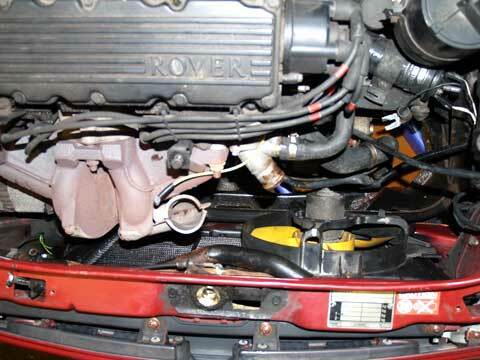 Thanks for a brilliant site with photos of fixing Rover 100 overheating problems. I have been through it and picked up some great tips. 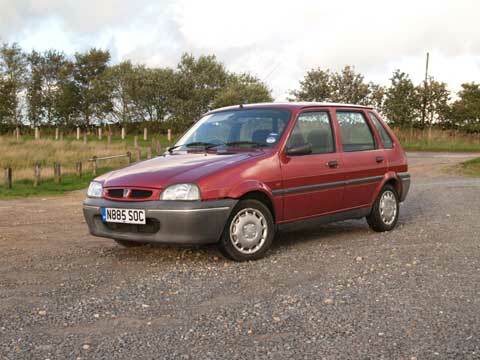 I have a 1991 Rover Metro GTi which I have owned for 18 years and covered 182,000 miles. For the last 9 years it has had re-occurring overheating problems. I usually manage to fix it only for the overheating to reappear again 10,000 miles or so later. I know anybody in their right mind would have got rid ages ago but I am a glutton for punishment. 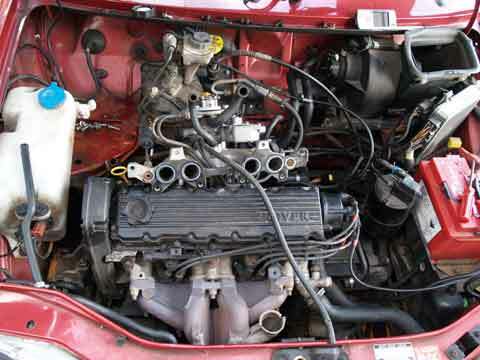 In the past I have replaced head gasket (found not to be faulty), thermostat (3 times), radiator (twice) , water pump (3 times) and cleaned out the ball valve in the inlet manifold (many times) and had the same experiences as yourself. 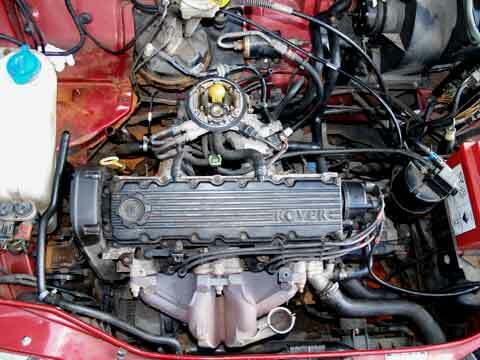 The Rover K series has an unconventional cooling system design. My understanding of it is as follows although this is only from my own experience so may not be correct. 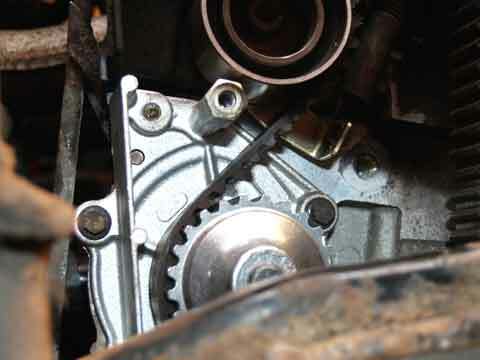 In most engines the thermostat is located at the top of the engine (normally the hottest place) near where the coolant leaves the engine to the top hose and onto the radiator. 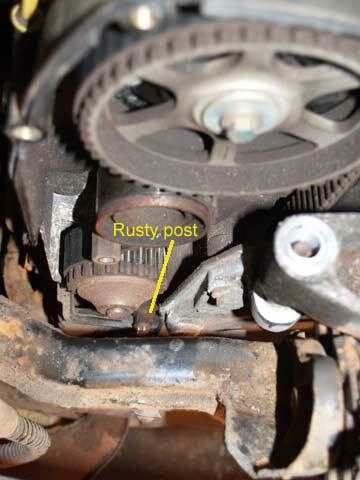 On the K series engine the thermostat is located where the coolant enters the engine on return from the radiator. According to Rover engineers this keeps the engine at a more constant temperature. However, it does mean that, when started from cold, the thermostat will never open because it is fed by coolant from the radiator and until the thermostat opens no coolant will flow through the radiator. To alleviate this the circuit of pipework to the heater returns coolant to the engine directed right into the thermostat housing and as the engine warms up this supply of coolant opens the thermostat and allows coolant to flow through the radiator. 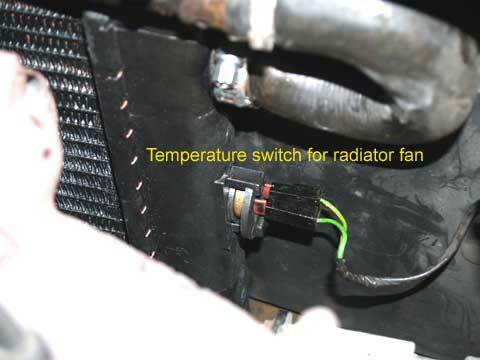 Note the coolant flows around the heater circuit even when the heater is turned off. My experiences of overheating has always been due to air locks in the heater circuit, this stops the coolant from flowing to the thermostat and causing it to remain shut. Bleeding the air from the heater hose which goes through the bulkhead fixes the problem but it will reoccur again when air builds up. 1. Water Pump. When I have had overheating problems changing the water pump normally fixes it. When I last changed the water pump I dismantled the old one to see how the water seal works. The water seal is a spring loaded affair and is designed so that as coolant pressure increases so will the pressure of the water seal increase. However, there is not much protection against air entering the engine's water jacket from outside. When an engine cools from hot a small vacuum is created in the coolant space as the coolant contracts, air should enter via the header tank cap to fill this space. However, a weak seal in the water pump would allow air to enter into the cylinder head coolant space and the next time the engine is started this air will get pumped and trapped in the heater hose. 2. The ball valve in the inlet manifold. This plastic ball valve is designed to allow air trapped in the cylinder head to escape harmlessly into the header tank. When air surrounds the plastic ball valve is falls and allows the air to pass, when coolant surrounds the plastic ball valve it floats and closes the valve. The problem with the ball valve is that it soon becomes clogged up with any gunge in the coolant and stops working. The answer is to either remove it like you did or clean it regularly. 3. Gunge in the coolant. This clogs up the plastic ball valve and restricts smaller pipes like the heater. To fix this flush the cooling system regularly. 4. Cylinder head gasket. Not as common a problem as reported. 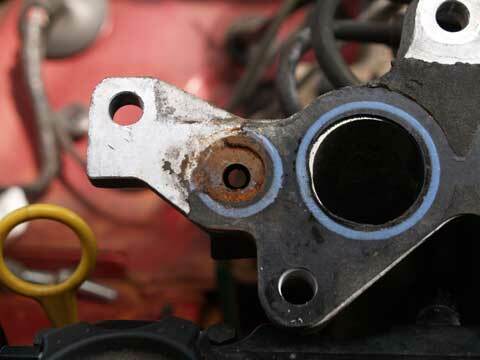 Finding air in the cooling system does point to the head gasket but is often not at fault. Head gasket failure will also have other symptoms like a highly presurised cooling system, external leaks, or contaminated oil.